Harvest day for the cannabis grower is a joyous occasion. OK, there is still quite a bit of work ahead., but the cannabis plants lifecycle is complete and the bud is ripe. It’s up to the grower to time harvesting perfectly in order to unlock the full potential of the flowers. 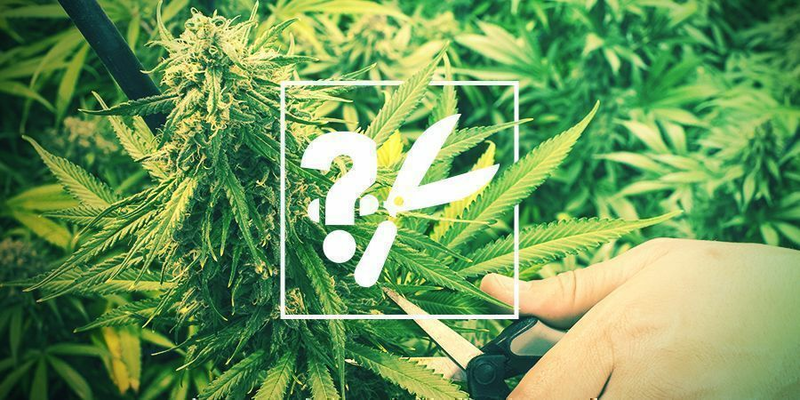 By the end of this grow guide, you will be able to recognise when your marijuana has peaked and how to harvest it like a professional cultivator. Female cannabis plants will send you plenty of signals that they are ready for harvest. The grower must regularly eyeball inspect and closely monitor plant behaviour in the final weeks of the bloom phase. Visual cues such as leaf yellowing and leaf drop are common as the cannabis plant transitions to senescence. Moreover, bud size and resin development will cease increasing. Pistils will curl and be mostly coloured in shades of orange/red and brown, with perhaps just a minority still white. Keep a keen eye for these indicators in the latter stages of flowering. 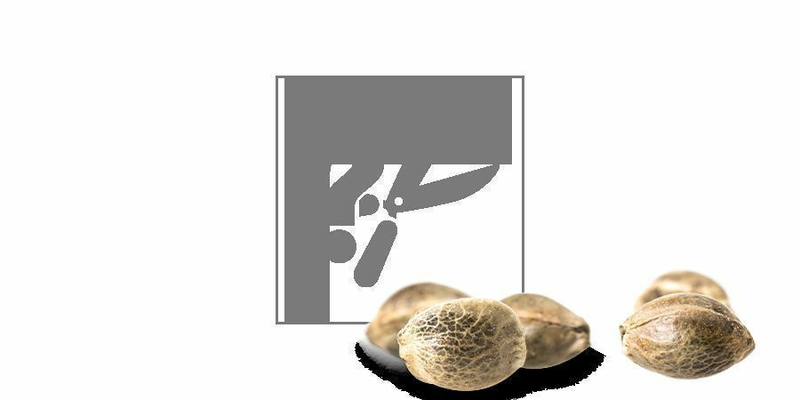 Always check the Zamnesia website or the reverse of the package of feminized seeds for an estimate of the strains performance. The data is pretty accurate and gives you a good idea of how long you will need to flower the variety before harvesting. Rubbish cannabis seeds from fly by night seed companies and bag seed are to be avoided. Unstable genetics rarely produce good crops. If you are cropping clones, make sure they are from a reliable source. Also, get as much info as you can about the strain from the donor grower. Most indoor photoperiod cannabis strains will be ready for harvest after 8-12 weeks of standard 12/12 blooming. Until the grower makes the switch from 18/6 to 12/12, plants can remain in vegetative growth indefinitely. Autoflowering cannabis strains can be cropped in as little as 8-10 weeks post germination with a continuous 18/6 cycle. If you are growing photoperiod cannabis strains outdoors, then to a large extent Mother Nature will be in charge of the crop schedule. Seeds must be sown in the right season for the crop to reach full potential. Naturally decreasing hours of sunlight will induce bloom at a far more gradual pace. Spring/Summer is usually when most outdoor growers get started to ensure the marijuana can be harvested in Autumn. They don’t call October "Croptober" for nothing in the Emerald Triangle. Sativa-dominant strains can require a whole lot of patience, typically needing 3-4 months to complete flowering. Hybrids and indica-dominant strains are swifter. They can be ready for harvest with 2-3 months of bloom. An outdoor photoperiod cannabis crop is a considerable investment of the grower’s time. It could be anywhere between 6-9 months from the day you germinate seeds before you are harvesting a stash. Autoflowering varieties have become increasingly popular amongst outdoor growers and beginner growers. Essentially they flower according to their age rather than the hours of light they receive. These varieties are far more predictable and often the only option for those living in cooler regions with short summers. They can also allow for multiple grows per year outdoors. Investing in a pocket microscope is highly recommended. 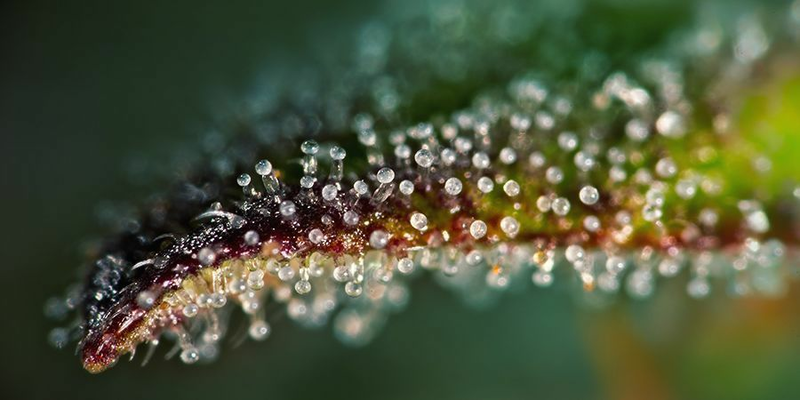 The most accurate way to assesses whether your cannabis is ready for harvest or not is to analyse the resin glands. That bulbous mushroom head sitting atop of the stalk should ideally be milky white coloured before harvesting the plant. If you want to catch those frosty nuggs at their very sticky best, we strongly recommend harvesting at this point. Clear glass-like trichomes are immature, while amber indicates the THC is beginning to degrade. Generally, more sativa leaning strains should be harvested with a mix of clear and milky resin heads to ensure an uplifting euphoric high. While indica leaning strains are best harvested with a mix of milky and amber trichs, perhaps even mostly amber trichs. The more amber the more sedative and couchlocking the effect as THC converts to CBN. It’s really a matter of taste as is the case with most things cannabis. 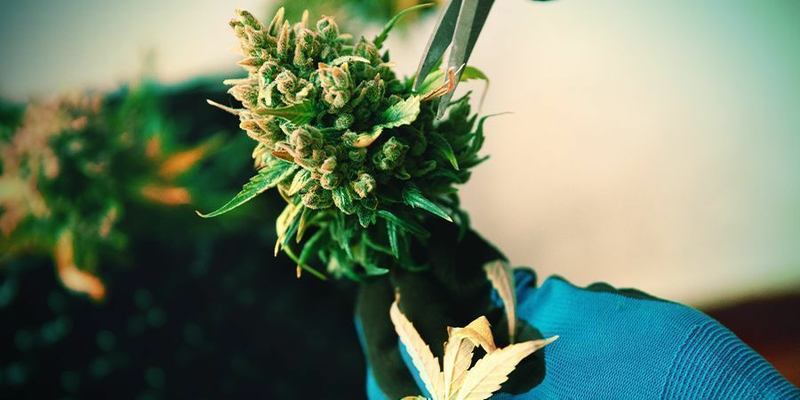 Regardless of which substrate or grow system or the particular nutrients used to grow the marijuana all crops benefit greatly from a pre-harvest flush. 1-2 weeks before the estimated end of bloom cease fertilising the crop and commence flushing. Use a light flushing solution or even just pure water. 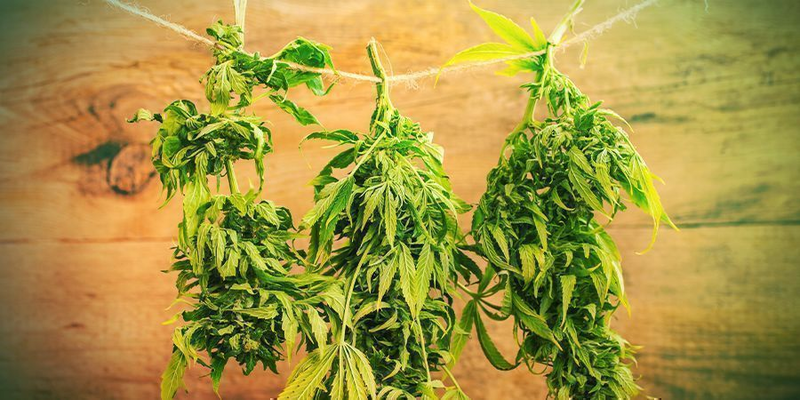 The flavour of the marijuana will be greatly improved as flushing for a week or two will leach out the salts that fertilisers accumulate in the medium. If you don’t flush the end product will be harsh and unpalatable. Allow plants to dry out for a day or two following flushing then give them the chop. Cannabis plants must be flushed the right way at the right time. This article will tell you all you need to know about flushing cannabis. Cardboard Shoe boxes, with air holes cut into the top for large buds. Brown paper bags for medium to popcorn sized buds. Alternatively, some fishing line strung across an empty wardrobe for larger harvests makes a perfect drying environment. Don’t cut through main stems at the base unless you are harvesting short, stocky indicas or autos. Home growers will typically apply pruning and training techniques to boost yields. All the popular, proven methods like topping, fimming, LST and ScrOG favour a branch by branch harvest approach. Chopping down plants entangled in a ScrOG is a really bad idea. Try to remove one whole branch clipped as close to the main stem instead. 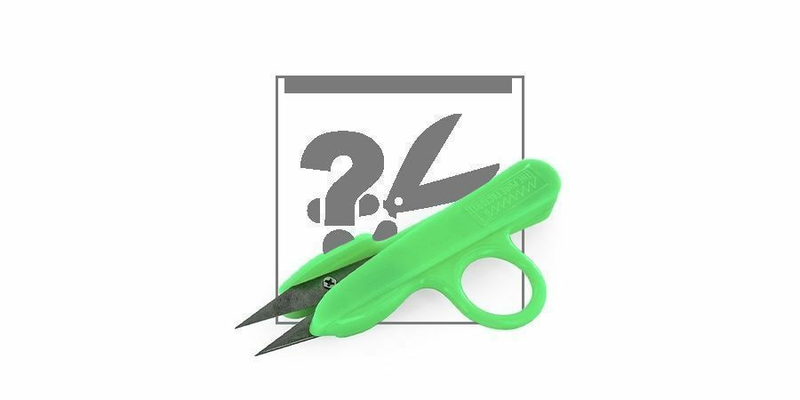 Cut the whole plant at the base of the main stem or prune a few branches at a time it’s your choice. Insisting that growers clip a plant from the bottom always and without exception is inconsiderate of indoor ScrOG growers and outdoor growers cropping monster ganja trees. 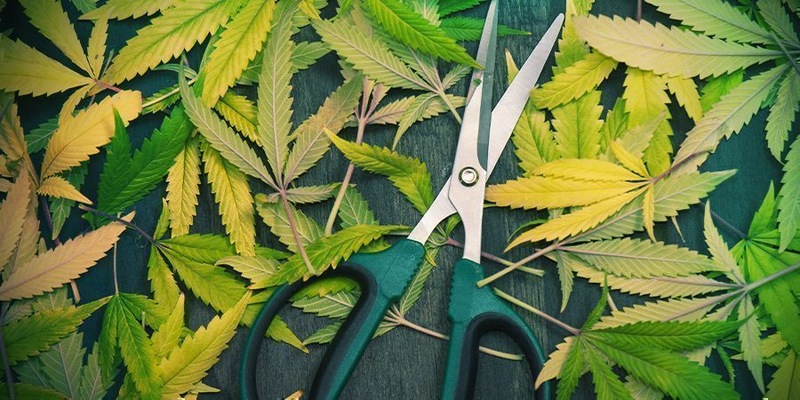 Go at your own pace and concentrate on doing a good job trimming your marijuana. Fan leaves and stems are garbage - but can be used later for either compost and/or infusions (if you have a lot of them). Start with this material and once it’s all removed get into those sticky buds. Handle buds with care and as little as possible. Try to just touch the stems. Sugar leaves are valuable hash making material so carefully remove as much as possible without spoiling the buds and save it in a paper bag. Not removing leaf material from buds, even portions of the leaf stem, is an invitation to mould and fungi. Not to mention leaves spoil the looks and flavour of the marijuana. Cannabis buds should be dried in a dark dry place slowly and evenly over a period of 10-15 days. Sunlight will degrade THC. Place manicured big buds into boxes and medium and smaller nugs in paper bags or string buds on a line across a wardrobe. Check buds daily but try not to fondle them too often. If using shoe boxes rotate the buds every other day so they dry evenly and gently. Similarly, jostle the paper bags of small buds slightly every other day. If you want to get fancy, consider using a CVault to cure your bud - they are excellent curing containers. 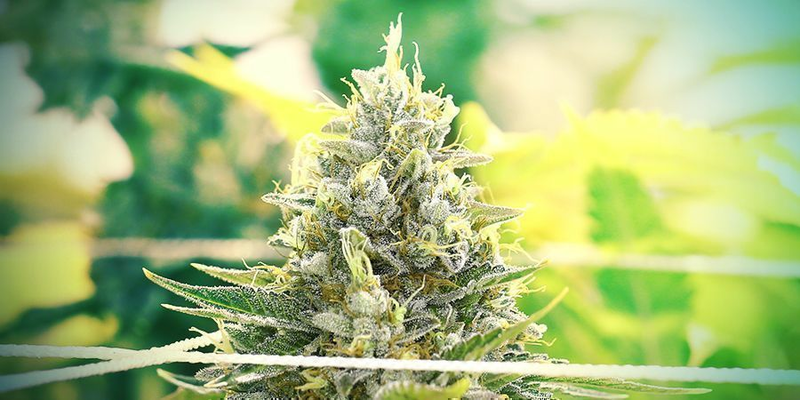 Place your thermometer in with the buds to make sure conditions are optimal for drying. Ideally room temp and 50% RH or as close as possible to this. Add a dehumidifier to the wardrobe if necessary. Congratulations you’ve just learned all you need to know to harvest cannabis successfully. WHAT DO YOU DO WITH TRIM LEAVES? Keep those sugar leaves. Store the trim from flowers, nothing else, in brown paper bags like popcorn buds. Let them dry for a week or two along with the primo bud stash. Then, transfer them to Pyrex airtight lunch box and put it in the freezer. This will buy you time until you make up your mind which cannabis concentrates to convert that sweet leaf into. Resinous trim makes great pollen, BHO and shatter.